I am impressed! This 100-year-old box camera is remarkably capable and can really deliver wonderful photographs. 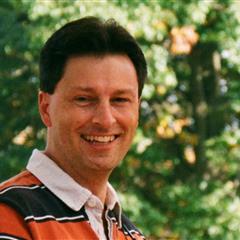 Meet the Kodak No. 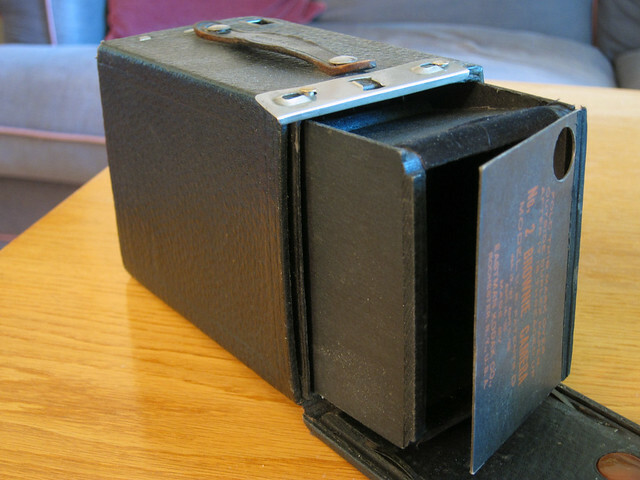 2 Brownie, Model D.
Kodak made the No. 2 Brownie from 1901 to 1935. Improvements over the years led to letter designations. The Model D was first issued in 1914. These were inexpensive cameras, costing between $2 and $3 when new. Of course, that was a lot more money in the early 20th century than it is now! Two 1914 dollars are worth almost $48 in 2014. Eric over at Load Film in Subdued Light has shared several eye-popping photos from his No. 2 Model D. His best photos are on T-Max 400, but he’s gotten solid results from all sorts of expired color slide and print film. See everything he’s shared from this camera here. Seriously, go look. When Eric mentioned that this Brownie takes readily available 120 film, I marched right onto eBay and bought one. I love the simplicity of box cameras, but the used market is flooded with ones that take defunct film sizes like 116, 122, and 620. But 120 is still made. As a matter of fact, the Brownie No. 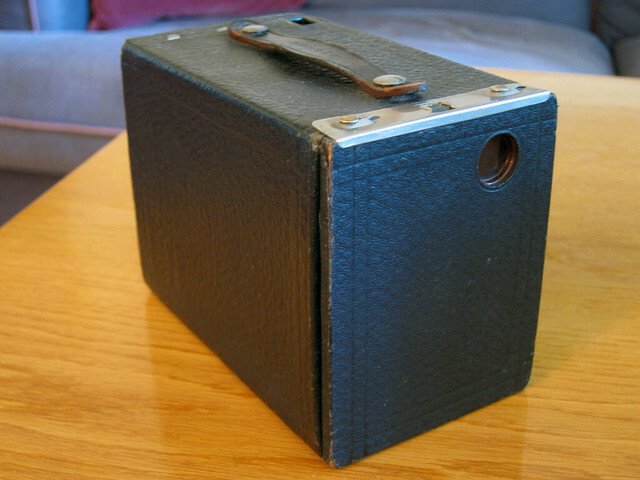 2 was the first camera to take 120 film. It astonishes me that this film size has been in production for more than a century! Because Kodak made bajillions of No. 2 Brownies, they’re plentiful and inexpensive today. I bought mine from a trusted vendor and paid a little extra for the privilege, about $30 shipped. If you like Eric’s work, or mine which I share below, go get one of these. The No. 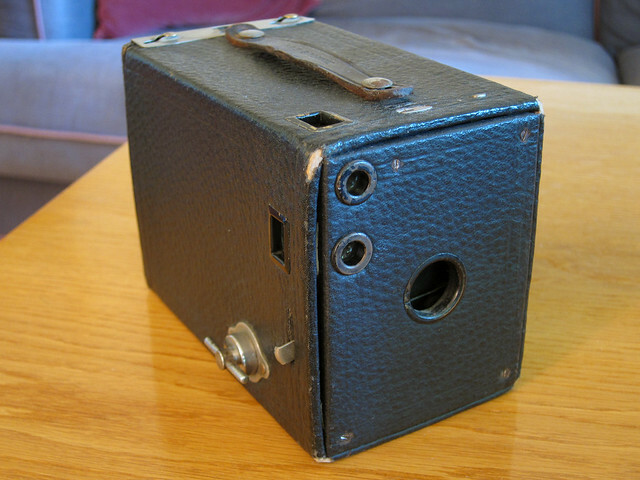 2 Model D is a cardboard box with a meniscus lens and a rotary shutter. It also offers a couple features that many box cameras don’t have: a choice of three apertures and a “bulb” setting that holds the shutter open as long as you like so you can take photos in low light. Pull-up tabs atop the camera at its front control both settings. The tab in front of the carry strap sets aperture and the narrower tab next to it enables timed exposures. I couldn’t begin to guess at what f stops these apertures represent, but a manual I found online says that the largest aperture (tab all the way down) is for snapshots outdoors in all but the brightest light, the middle aperture is for bright sunlight and indoor time exposures, and the smallest is for time exposures outdoors on cloudy days. To take a picture, slide the shutter lever. It doesn’t spring back, so for the next photo you slide it in the opposite direction. If you pull up the bulb tab, you slide the lever once to open the shutter and again to close it. The innards have a nice feature: a flap that holds the film flat. When you load film, be sure the flap covers the backing paper. I gather that later Model Ds did away with this flap and also changed the sliding latch that holds the camera closed to a spring catch. I happened to have a roll of Kodak Ektar 100 in the fridge, so I spooled it into the Brownie. 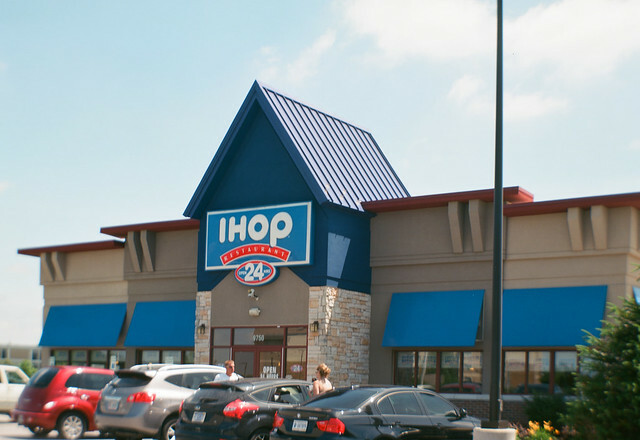 I was out and about in suburbia with it and shot a bunch of colorful commercial buildings. And holy wow, look at what this camera and film did! The exposures are perfect, helped I’m sure by Ektar’s good exposure latitude. The color is wonderful even if the reds are oversaturated. The corners are soft, which is typical for this class of camera. But look at that sharpness in the center! It about pokes your eye out. That sharpness isn’t quite as good when you look at these photos at full scan size. But this camera’s 1914 mission was to provide snapshot-sized prints often no bigger than the negatives themselves. When you put Aunt Martha in the middle of the viewfinder and pushed the shutter button, the print would let you see right into her eyes. 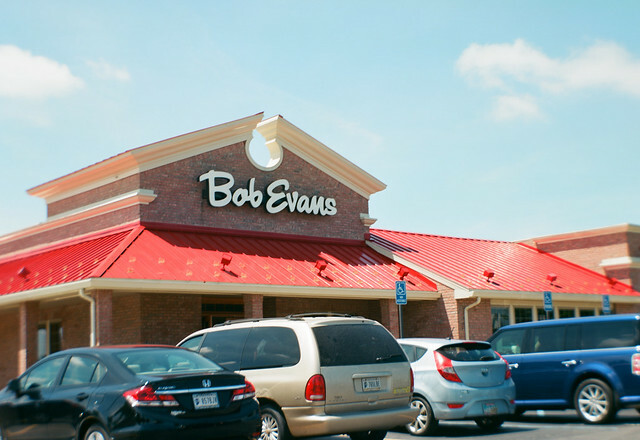 But I don’t have an Aunt Martha, and I was looking for colorful suburban scenes, so I kept shooting storefronts. I next tried T-Max 400 in the No. 2 Model D to see if I could replicate Eric’s good results. I didn’t have the stellar luck Eric routinely gets on this film, but a tiny bit of Photoshop tweaking of exposure and contrast brought out good detail. That wonderful center sharpness was still plenty in evidence, however. 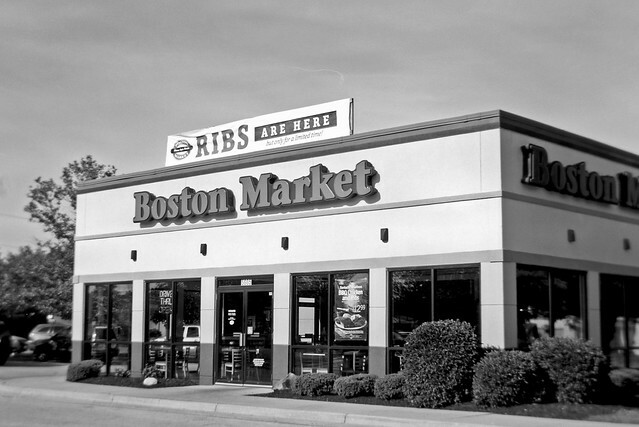 This, by the way, is the same Boston Market as in this post in which I considered the rapidly changing suburban built environment. My No. 2 Model D does have a slight light leak that occasionally shows up in the bottom left corner. You can see it in this shot of Lafayette Road in northwest Indianapolis. It was built in the 1830s as part of Indiana’s early “state road” system, connecting Indianapolis to Lafayette. 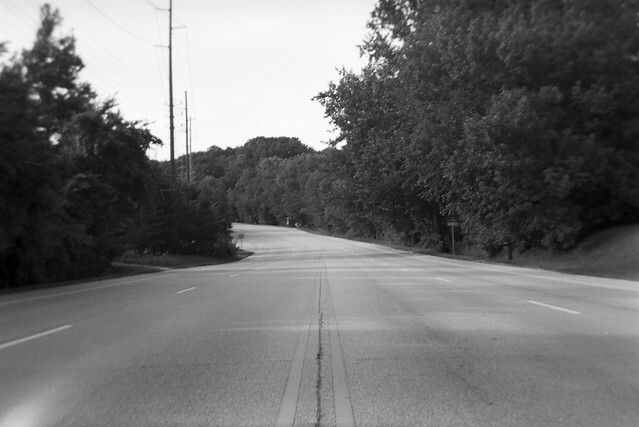 It became part of US 52 in 1927 and was upgraded to four lanes during the 1930s. But by the 1960s, US 52 was rerouted along the new I-465 beltway around the city, and Lafayette Road was turned over to the county. Today it’s just a lightly traveled road in a part of Indianapolis that still feels rural. I was having a lot of fun with the Brownie and wanted to keep shooting, so I loaded a roll of Ilford Pan F Plus 50. I figured such a slow film would be just right given that films of the Brownie’s day were probably similarly slow. Unfortunately, all of the images were underexposed and required some Photoshop surgery to breathe life into them. This shot is from a little road trip to Terre Haute that my sons and I took along US 40 (the old National Road) one evening. I was shooting probably 20 degrees from directly into the setting sun, which did this photo no favors. 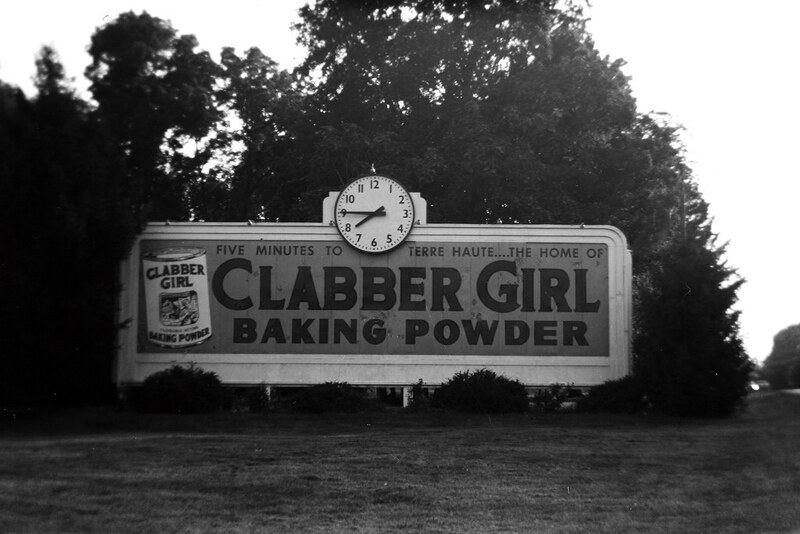 Clabber Girl baking powder is made in Terre Haute. 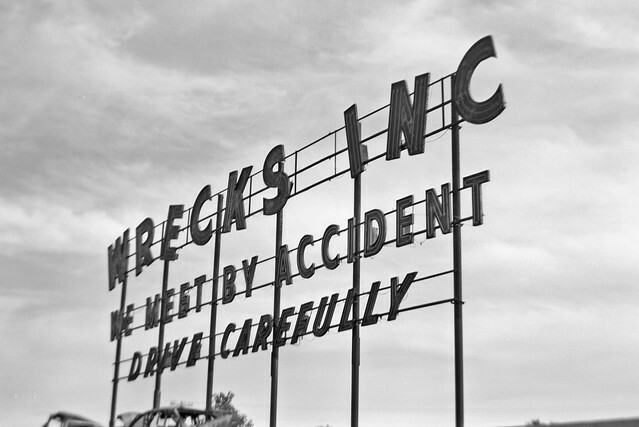 This sign has been welcoming visitors to town for many decades. I first saw it in 1984 when I visited the college I ultimately attended. We had dinner at a rib joint right on the National Road, which is Terre Haute’s main drag and is better known there as Wabash Avenue. 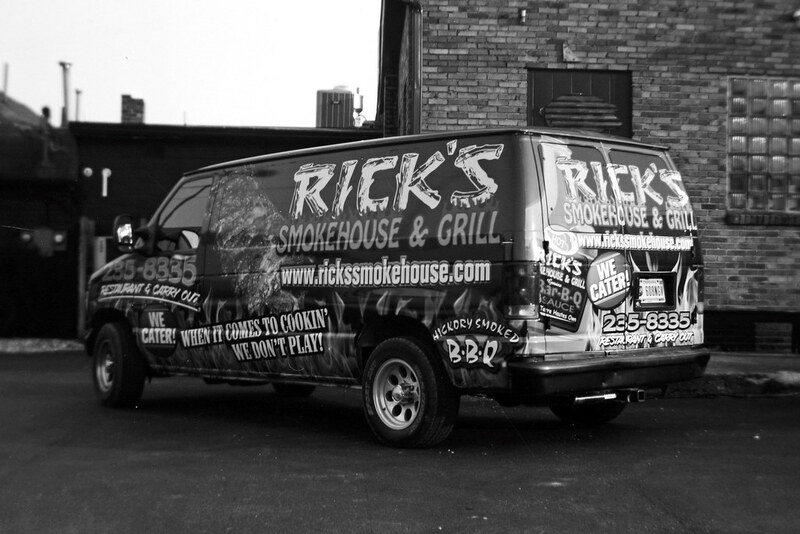 This photo of their catering van turned out the best of all of my shots on the Ilford film, with rich blacks and good detail. If you enjoyed these photos, check out my entire Kodak No.2 Brownie Model D gallery. I’m glad I shot the Ektar first. This centenarian camera was born to shoot this modern film. If I had shot the Ilford first, I might not have had such excited feelings about this camera. But now I know: keep plenty of Ektar in the fridge just for this great little box camera.